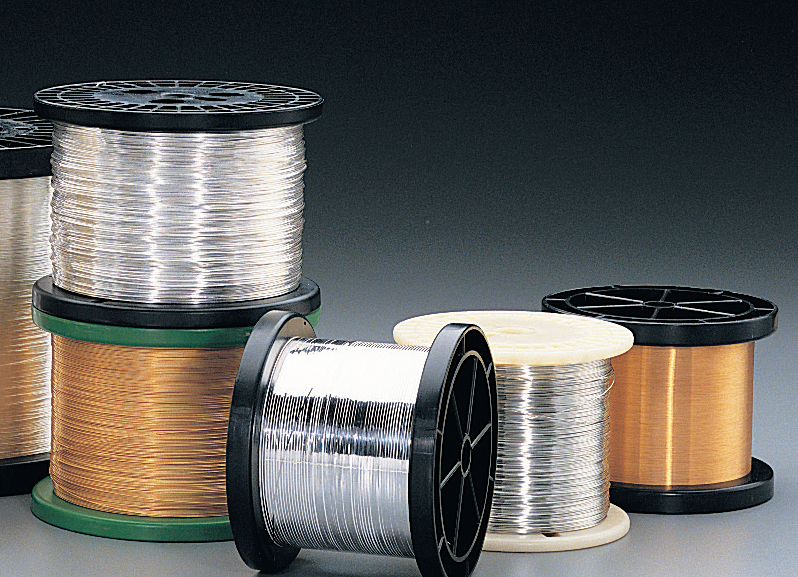 MWS offers a complete line of electroplated wire in round and ribbon shapes. Wires inventoried include those meeting QQ-W-343, AA59551, Mil Std 1276, ASTM B298, ASTM B355, and ASTM B488 requirements. These insulated wires were developed for applications where severe operating environments may degrade conventional conductor materials. Conventional copper wires are plated with gold, silver, or nickel in a variety of plating thicknesses, and then are film-insulated. At elevated temperatures, these wires can operate for extremely long periods of time, as the plated constructions prevent high-temperature chemical migration and conductor oxidation. Tin and copper plated wires are insulated for lower temperature applications. In addition to conductor protection, these plated constructions can improve a wire’s solderability, conductivity, and overall strength. Film thicknesses can range from single to extra heavy special builds. See Magnet Wire Insulations for a complete list of insulations. Sizes 14-56 AWG can be produced in single end, parallel bonded, and twisted constructions. At MWS, we use electroplating to create specialty wire to provide a solderable, conductive or corrosion-resistant surface. The effect of electroplating depends on the material used. Tin and tin-lead provide corrosion resistance and improved soldering characteristics. Nickel prevents oxidation and corrosion and is specified when high temperatures are encountered or where wire is used in high reliability insulation systems which require high curing temperatures. Silver likewise offers superior thermal resistance, enhanced solderability, and lubricity plus best electrical conductivity compared to other metals. Gold does not oxidize like most metals, so it is recommended for high reliability electrical components to avoid loss of conductivity due to oxide layer buildup. It is particularly effective on fine and ultrafine wires where even slight loss of cross-sectional area can cause significant loss of wire’s capacity.